For the past 5 or 6 years, I used iPhones as my default phones. But a few months ago I decided to switch to Android. I tried Android devices before, but never as my default phone. At the beginning I started using a Samsung Galaxy S4 (a 2013 5″ device), but later I switch to a Xiaomi MI4 (a 2014 5″ device with better specs). In case you don’t know what the launcher is, think of the shell that allows you to launch the applications. It is the first thing that appears when you turn on the phone. In a way, it defines the UX. Each phone maker customize the Android launcher according to its needs. And you can also download 3rd party launchers. This is both a good thing and a bad thing. The bad thing is that every phone maker have a different launcher, making it difficult to switch to other Android devices, since the UX is different. Google has its own launcher called Google Now Launcher, and tries hard to make sure that Android makers don’t differ too much from it, although that is not always true. Samsung, as an example, ships its phones with a launcher called TouchWiz. It doesn’t differ that much from Google Now Launcher, but its changes make it a worse phone, not a better one. Xiaomi, on the other hand, ships its phones with a completely different launcher which makes your Android device behave like an iOS device. The good thing is that you can use a different launcher if you don’t like the default one (or create your own). This as a good thing because everything that can be configured, changed or replaced is an opportunity for innovation (see below). Google’s approach to the launcher is somewhat different than iOS. On the one hand, on iOS you place the applications on the “Application Layer” (Springboard); if you remove an application from it, the application gets removed. The applications can be moved, or grouped as you want. On the other hand, Google’s launcher has two layers: a kind of “Application Layer” (App Drawer), where you can find all the installed applications, but in this case the applications are sorted alphabetically and can’t be grouped. And the “Home Screen Layer”, where you can group or rearrange the apps which is a layer on top of the “Application Layer” (think of the Desktop analogy for the PCs). There are more differences between Android’s launcher and iOS’ launcher, but I don’t want to enter into too much detail here besides saying that they are different, and I tend to prefer iOS approach, although Android’s approach has its strengths too. On Android, everything is “configurable” or “hackable”. You don’t want to use Chrome as your default browser ? You don’t like the default launcher? You don’t like the default camera application? You can change them. Truth be told, not every device offers the same degree of “hack-ability”. Samsung Galaxy S4, as an example, doesn’t offer as much customization as Xiaomi. Being able to change different parts of your OS allows innovation. As an example, they keyboard Swype was created thanks to that. And this is a good thing. On iOS, on the other hand, is the opposite. Apple controls the iOS experience almost too much. Only recently (iOS 8) Apple introduced APIs to hook with certain parts of the OS (App Extensions), but it is still far away from the “hack-ability” of Android devices. As an example, it is still not possible to change the default browser on iOS. The soft buttons are the buttons that are at the bottom of the phone. They are called “soft buttons” because you don’t have to press them in order to activate them. Just a touch is enough. Back button: N/A on iOS. I find the soft buttons error-prone. Sometimes when I’m writing an email or sending a message, instead of tapping the “space bar”, I, by mistake, activate the “Home button”, and the application “disappears”. At the beginning I thought that the application had crashed, until I discovered that I was activating the soft button. The only benefit that I see on using soft buttons, is that they can be placed in any part of your phone. As an example, on the Nexus 7 tablet, if you rotate the tablet to landscape mode, the buttons will be placed at the bottom automatically. But most of the phones don’t have that feature, why do I need soft buttons? One issue is that some device makers put the “back” button at the bottom-left (Nexus 7), and others put the “back” button at the bottom-right (Xiaomi MI4 and Samsung S4). One bonus point for the Samsung S4 is that he “home” button is a real button and not a “soft button”. On Xiaomi, “back” is at the right. On Nexus 7, is at the left. But if you had browsed other pages before, “back” open the previous page that you have browsed. But despite its inconsistencies, I like this feature pretty well and I miss it when I use an iOS device. The applications that I use all the time are both on iOS and Android: Strava, Yelp, Uber, Chrome, Google Maps, Facebook, Skype, Twitter, etc. The games, however, is somewhat different. Most of the games are on both platforms, but some games, specially created by small studios, are only available on iOS or arrive a few months later on Android. At least Android has Humble Bundle games. There are some applications that are Android only basically due to App Store’s restrictions. As an example a Commodore 64 emulator and a SSH server are only available for Android (those are 2 real applications that I use from time to time). The one thing that I miss from iOS, is Safari’s “Reader mode”. There are some “Reader mode” extensions for Chrome Desktop, and it is possible to add a “Reader mode” by changing the chrome://flags on Chrome Mobile. But the option is so hidden, that I think nobody is using it (and is one of the most useful features for mobile browsing). A few years ago, when I tried my first Android devices, I had the impression that their battery life were pretty bad. I don’t know if the battery life improved, and/or the OS and applications are more battery friendly, and/or I charge the phone more often since I have it with me all the time. But my impression is the battery life is comparable with iOS. The 3 Android devices that I regularly use (Nexus 7, Xiaomi MI4 and Samsung S4) have completely different Settings application. The Settings is something that the launcher cannot change. 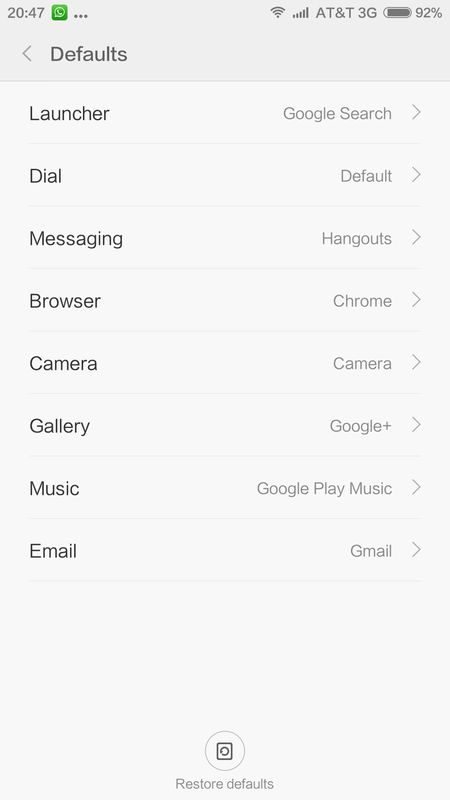 So replacing the launcher with the Google Now Launcher won’t replace the Settings application. 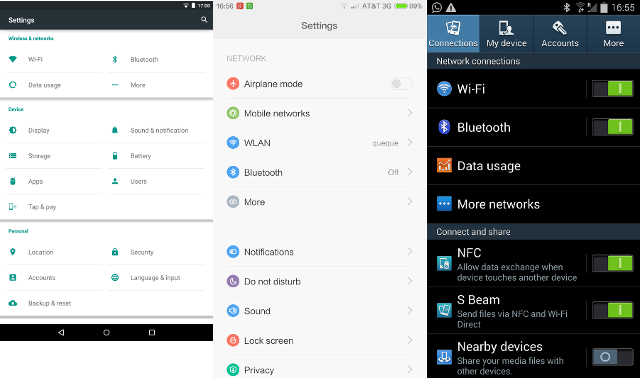 Samsung Galaxy S4 + Android 4.4 has a Settings that is not easy to discover certain settings. Samsung and Xiaomi are trying to create the Samsung and Xiaomi experience. For Xiaomi, it makes sense to replace the official Android Settings with their own, since they want to clone the iOS experience as much as possible. But for Samsung, I wouldn’t know. They replaced the Google experience with a different one that is neither similar to iOS and more difficult to use than the Google’s one. The Xiaomi MI4 is a very good, inexpensive phone for people who want to try an Android device for the first time, but still want to have an “iOS experience”. The only issue that I have so far with it is that it doesn’t support LTE. Apparently the new version already supports it. The iOS keyboard, I don’t miss it at all. It is almost impossible to tell whether you are in lower or upper case.